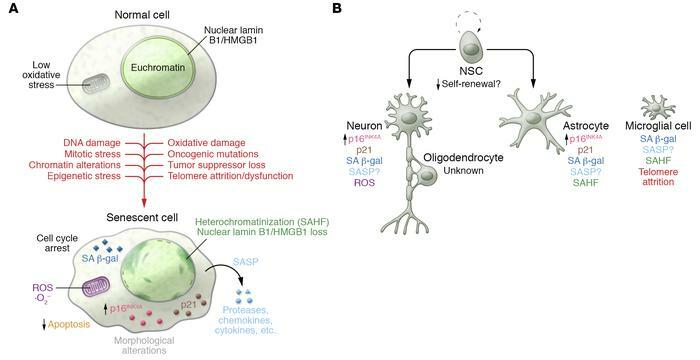 Hallmarks of senescence in CNS cells. (A) A number of stressors, both intrinsic and extrinsic, can stimulate the conversion of otherwise normal cells into senescent cells. Once they have entered into this state, a number of distinguishing qualities can be observed. depending on the cell type and senescence-inducing stimuli. (B) Senescent cell evidence and identity are observed in neurological aging and pathology. Commonly observed features reminiscent of senescence are indicated for the various cell types. See text for extended discussion and references. SAHF, senescence-associated heterochromatin foci; NSC, neural stem cell.